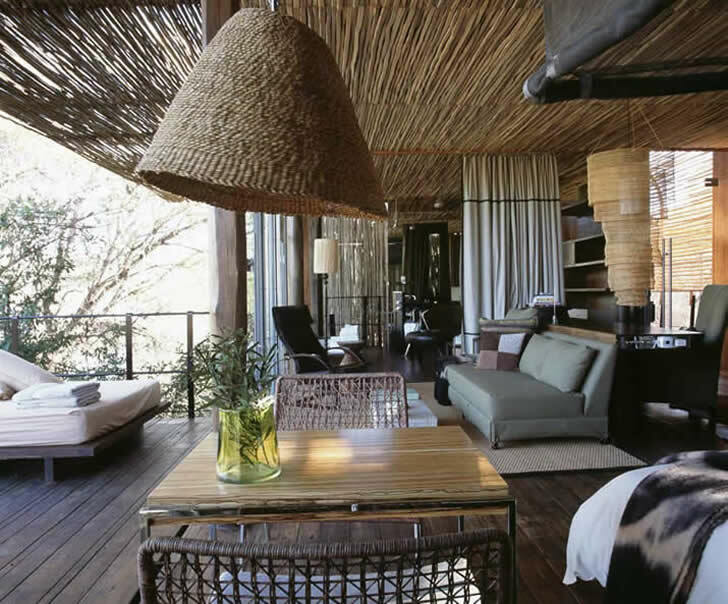 Singita Sweni was designed with ecological principles in mind. Glass cubes ensconced in nests of woven latte branches are merely temporary structures, allowing visitors to bear silent witness to and connect with the untamed environment outside. Separated from Singita Lebombo by less than a kilometre, the six-villa Singita Sweni (the smallest of the Singita lodges) shares its big sister�s diaphanous architectural sensibilities and directive to touch the earth lightly. 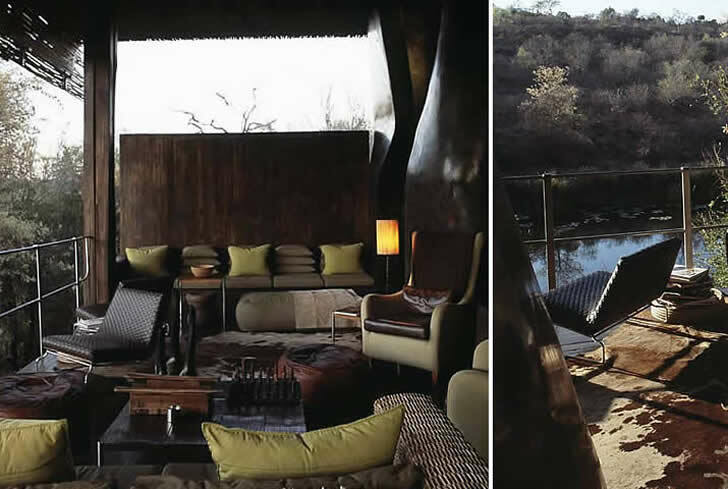 Unlike Singita Lebombo, however, Singita Sweni does not perch high on a cliff, nor does it mimic Singita Lebombo�s luminously pale, unadorned interior design. Instead it stands � cool and serene � on timber stilts set low on the dappled water�s edge of the Sweni River, a recurring colour palette of khaki, muddied browns and fresh greens referencing and paying homage to the river and the lush euphorbia and fever trees that it nourishes. Shifting light is an ever-present feature in the spaces at Singita Sweni, the intentional end result of a structural concept that employs glass, steel and wood to address the conditions of the Elysian riverside site. A series of cubes elevated from the ground on timber stilts constitute the building, which is sectioned into a central meeting place, raised wooden walkways, dark timber decks oriented towards the views, and six exclusive suites each with their own lounge, dining area and pool. 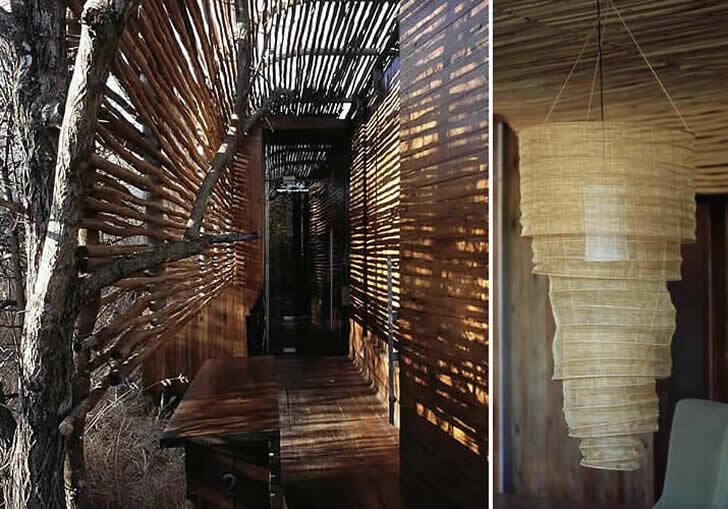 These glass cubes have been ingeniously �wrapped� in woven latte screens that serve both to holistically integrate them into the vegetation and topography, and veil them in shade and preserve the privacy of Sweni�s two-legged residents. While there is a determined sense of modernism to the architecture, this is counterbalanced by occasional interruptions from nature, organic or otherwise: for example, the euphorbia trees that rise out of the viewing decks, their unrefined architectural forms creating living sculptures; and the dramatic interior feature walls in the public space (installed to partially conceal areas like work stations), which were fashioned from concrete, then distressed and highly polished to resemble smooth, weather-worn tree trunks. 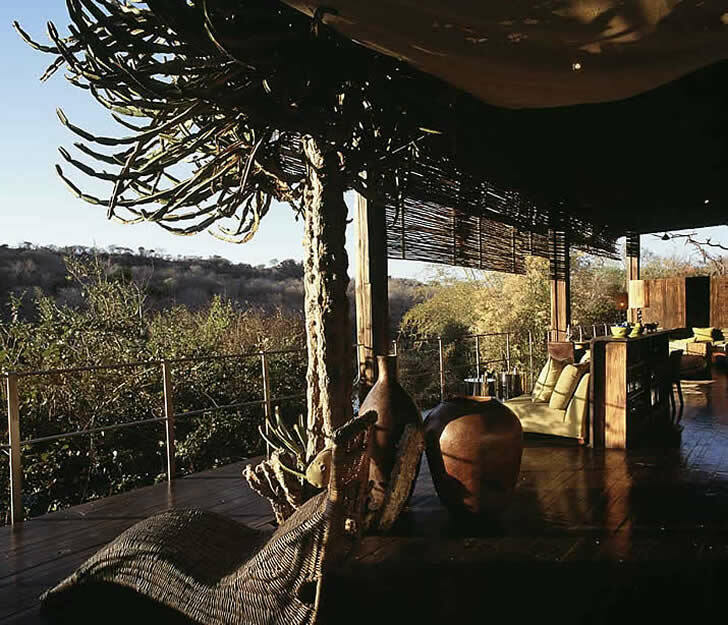 Even the fireplaces � created the same way as the concrete �tree trunks� � appear to have been split down the middle by lightning (a design element shared with Singita Lebombo). This is the second Singita project that was entrusted to architects Andrew Makin and Janina Masojada of OMM Design Workshop and Durbanbased Joy Brasler, and united them once again with designers Boyd Ferguson and Paul van den Berg of C�cile & Boyd�s. Like the architecture, the interior design direction was profoundly influenced by ecological principles, and like the architecture, it has been masterfully interpreted in a way that is site-appropriate but also luxurious, original and contemporary. African artefacts, ethnic artworks, earthenware pots, indigenous materials, leather and khaki take care of the �safari� aspect, while urban comforts, modern finishes and elegant furnishings convey the other face of Sweni � an exclusive boutique hotel in the bush. The designers have sought to connect the interiors to the landscape via Sweni�s palette: a potent brew of mud browns uplifted by avocado, lime, olive and other leafy greens. The designers have also employed their signature inventiveness to create another subtle layer of interest. Open up the pale cream menu and you are greeted by a bright green sheet of paper; look into the pantry and you are met with a cranberry-red interior; or throw back the chalk-coloured bedcovers and recline on a bright orange sheet. �We call it �hiding colour�,� explains Paul van den Berg. �Just as nature reveals its jewel-like tints subtly, so brighter colours surprise guests as they discover Sweni. It�s like a bird that at first looks ordinary, but when it lifts its wings there�s this shock of vibrancy.� In fact, uncovering all the details at Sweni is a veritable voyage of discovery. It�s only when you look closely that you notice the floors and decks are made out of random planks of wood, and that the curtains in the bedrooms have been edged in leather and given an urban edge with stainless-steel rivets embedded into the fabric. The focus of each villa is the low-rise floating bed with its cascading �wall� of grey beaded curtains and mosquito-net �tent�.The heavyweight textile curtains can be configured in different ways, to either open spaces up to the views or shroud them in privacy as the day draws to a close � effectively allowing guests to create their own architecture within their particular glass cube.